The Little Persia neighborhood of Los Angeles is the cultural center of the largest community of Iranian immigrants in the United States. Iranian Americans are closely watching protests in Iran, where a government crackdown on demonstrators has led to the deaths of 21 people and the arrest of more than 400 over the past week. Thousands of counter demonstrators have marched to support the regime. Many in the Iranian community of Southern California, the largest outside Iran, are hoping for a peaceful resolution, and reform. The largest concentration of Iranian immigrants in Los Angeles is found in the Little Persia neighborhood on the city’s west side, where people criticize Iran’s clerical government, which they widely view as incompetent and corrupt. “We are in fact very anxious that this might lead to even more violence,” he adds. American officials have spoken out against the Iranian government’s actions. U.S. ambassador to the United Nations Nikki Haley has called on the U.N. Security Council to hold an emergency session over the protests and crackdown. Iranian authorities have placed curbs on social media sites such as Instagram, and President Donald Trump has promised “support from the United States at the appropriate time” in messages posted on Twitter. Supreme Leader Ayatollah Ali Khamenei speaks in a meeting, in Tehran, Iran, Tuesday, Jan. 2, 2018. Photo was released by an official website of the office of the Iranian supreme leader. Some Iranian Americans say the United States should tread carefully because the anti-government protests are homegrown. 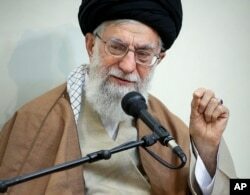 Iranian Supreme Leader Ayatollah Ali Khamenei has already blamed what he calls “enemies of Iran” for sparking the protests. The secretary of Iran's Supreme National Security Council has accused the United States, Britain and Saudi Arabia of being behind the dissent. The demonstrations started last week as laborers and workers in a number of cities rallied against corruption and high unemployment. Sahimi does not believe that the protests are as broadly based as those of 2009, when students and members of the middle class denounced what they viewed as a rigged election in a movement that came to be known as the Green Revolution. Los Angeles publisher Bijan Khalili blames mismanagement of the Iranian economy and says Iranian officials will not accept responsibility, and “the only thing that is left is blaming on foreign countries and foreign people,” he says. Muhammad Sahimi says that U.S. sanctions against Iran also played a role, and notes that President Trump has promised to strengthen those sanctions by removing waivers on Iranian oil, in place since Iran agreed to curb its nuclear program in 2015. He says stronger sanctions will only worsen economic conditions in Iran. Realtor Sam Kermanian says the nuclear agreement raised the hopes of Iran’s people, but when the benefits failed to materialize, disappointment gave way to anger over rampant corruption among the clerical elite. Los Angeles grocer Todd Khodadadi says Iranians are expressing legitimate grievances, “trying to get their rights, and they raised their voice, and hopefully, peacefully, they (will) get what they want,” he says. These Iranian Americans say the nations of the world should defend the right to peaceful protest, but leave these protests in the hands of Iran’s people to avoid giving the regime an excuse for a further violent crackdown.